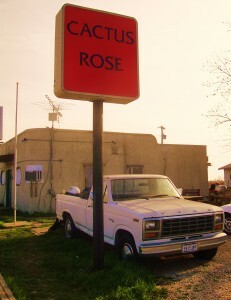 One of the great old-school Texas roadhouses, Cactus Rose sits quietly alongside hwy 95 just north of that great trove of Central Texas barbecue; Taylor. This is where I go to escape the big city life that is the Austin that we find ourselves in in 2012. Long and low slung, the old building has been in use in one fashion or another since 1946. Beers are cheap and ice cold, service is sassy and fast moving, there’s a bank of gaming machines if you’re into that sort of thing and a recent visit found a very nice chili dog buffet set-up off to one side in a handsome vintage Crock Pot. The scene is nice and peaceful. Somebody has fed a bunch of quarters in the jukebox and apparently they grew up in the Deep South back in the 70s as we’re treated to a musical tour of Statesville, Georgia and Jacksonville Florida for an hour or so. A day spent at Davis Grocery and Barbecue, followed by a nice drinking session at Cactus Rose is a fine way to spend a Texas afternoon. This entry was posted in Rural Texas, Texas Daily Photo and tagged rural Texas, texas, Texas Daily Photo, Williamson County. Bookmark the permalink.